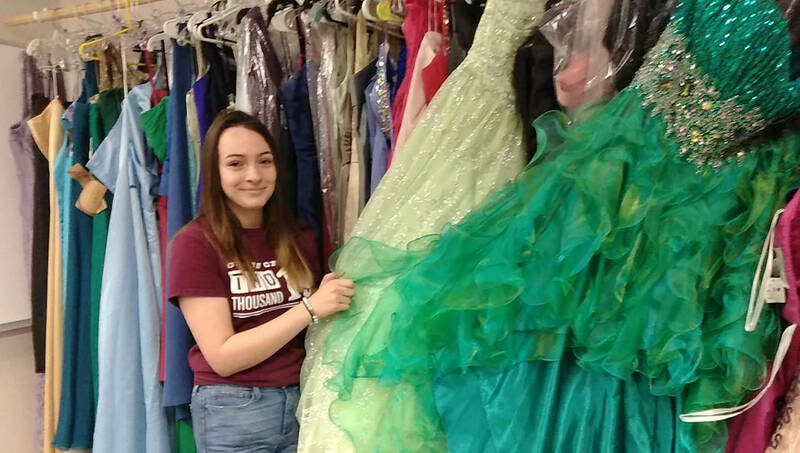 Selwyn Harris/Pahrump Valley Times PVHS Senior Sabrina Jaynes displays one of the many prom dresses for attendees to choose from. Jaynes who is also an AmeriCorps volunteer is overseeing the Prom Closet event along with roughly 40 additional volunteers. 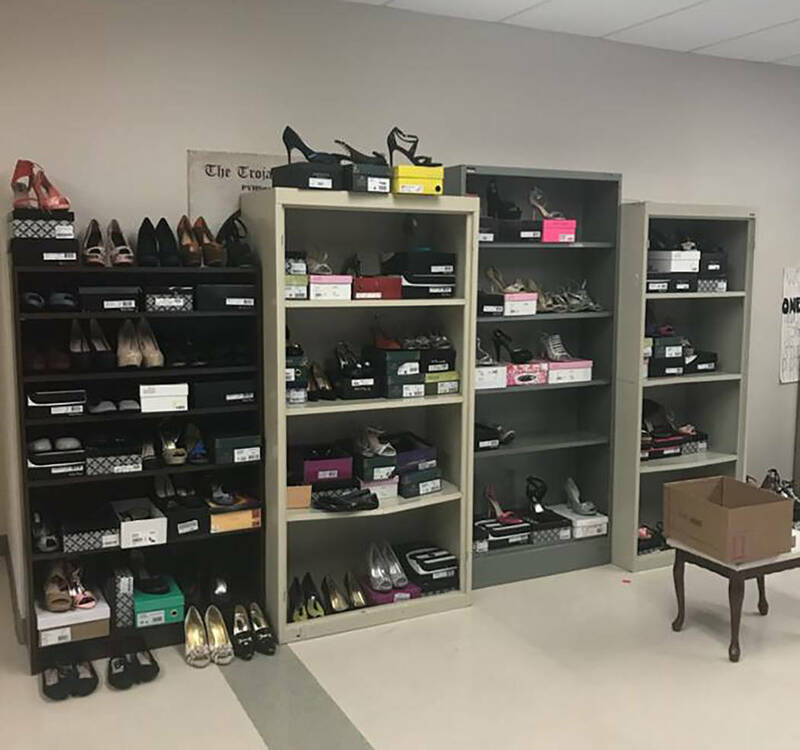 Special to the Pahrump Valley Times Prom attendees can choose among the scores of formal footwear for males and females, provided by Project 150. Top of the line costume jewelry is also available to prom goers, once again this year. The event will be held at Mountain Falls. High school Registrar Jennifer Shockley said an organization known as Project 150 from Las Vegas is providing formal wear to any and all students attending the event once again this year. The best part, Shockley said, is the attire bears no cost to students or parents. 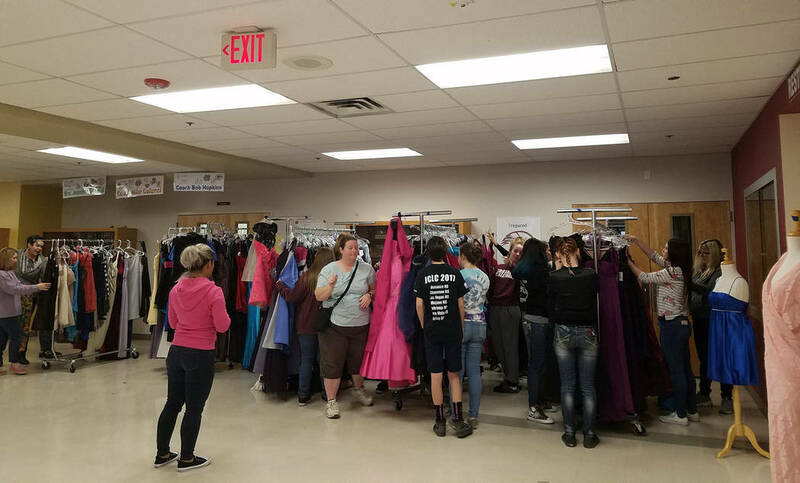 The event, held on a first-come-first-serve basis, is scheduled for Saturday, April 13, from 11 a.m. to 3 p.m.
Project 150, Shockley said, has been a longtime supporter of the Prom Closet program in Las Vegas schools. Shockley also noted that participation in the program is a very simple process. Additionally, Shockley said the items offered will cover the students from head to toe, including fashion accessories. Shockley also noted that upward of 40 volunteers from the high school and the community are also participating this Saturday. One such volunteer is Pahrump Valley High School senior Sabrina Jaynes, who will actually oversee Saturday’s event. Jaynes spoke about a fashion consultant who will also be on hand to provide advice to female students attending this year’s prom. In addition to Saturday’s Prom Closet, Jaynes said another event will coincide with the program at the high school. Shockley, meanwhile said the event is a great opportunity for students who either can’t get to Las Vegas to get a dress, can’t afford it, or even have yet to find what they want to wear. Regarding the prom’s venue this year, Shockley said it will be held May 4, at Mountain Falls on the valley’s south end.